Heat oven to 375°F. Separate dough into 5 biscuits; split each into 2 rounds. Press or roll each into 4-inch round; place on ungreased cookie sheets. Bake 7 to 9 minutes or until golden brown. Meanwhile, heat chicken strips in microwave as directed on box. Spread about 1 1/2 teaspoons salad dressing on each warm biscuit half. 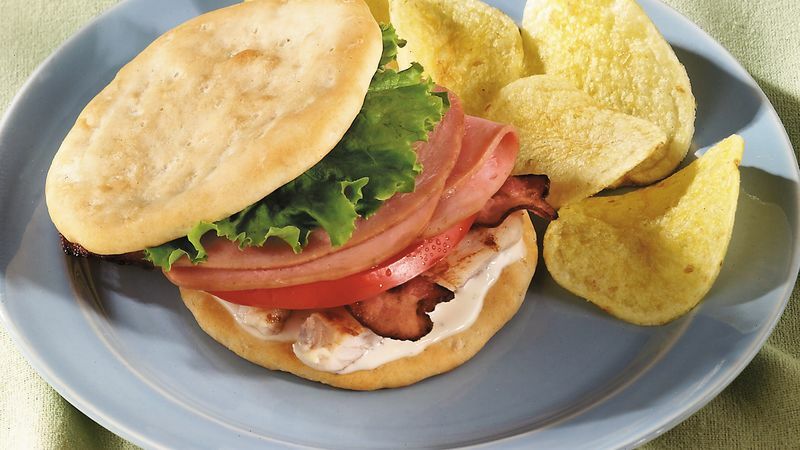 Top 5 biscuit halves with chicken strips, bacon, tomato, ham and lettuce. Cover with remaining biscuit halves. Kids will love these tasty sandwiches served with crispy celery and carrot sticks, and cucumber slices. Serve additional ranch dressing for the vegetable dip.